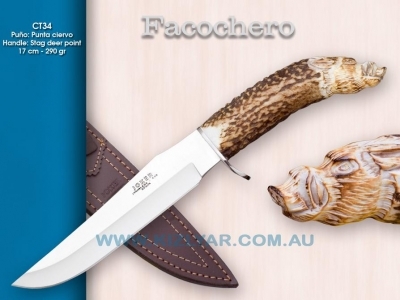 The CT-34 Facochero (Wild Boar) is a medium/large size clip point knife, and is an ideal all-rounder hunting knife. Its long cutting edge is ideal for meat preparation, while the overall length is a bonus if used as a sticker. The handle is carved from a single piece of stag horn and the Rat-tail tang runs through its centre. The grade of high carbon used in this knife is the German 1.4125 Krupp steel, which is also known as 440C with 1% Carbon rating. 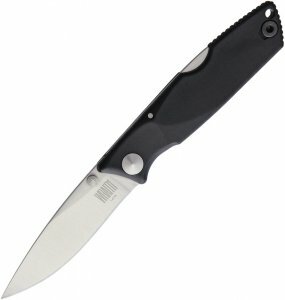 This is a very well balance knife, which is a must for a good quality hunting knife. In addition to this, the beautifully carved handle makes a great collectors piece. 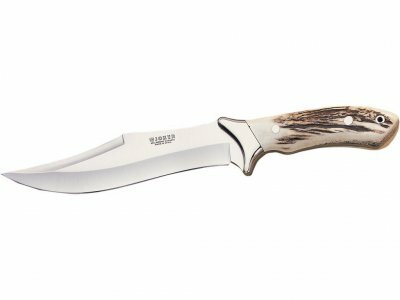 NOTE: The hande material of this knife is natural red deer horn and it has been kept in its original form (shape). 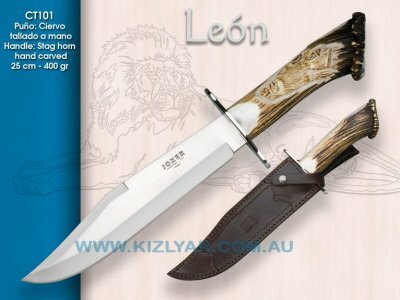 Therefore, although all of the knives feature similar hand carving of a boars head on the end of the handle, the overal thickness and curvature of the handle may vary slightly from the picture shown. 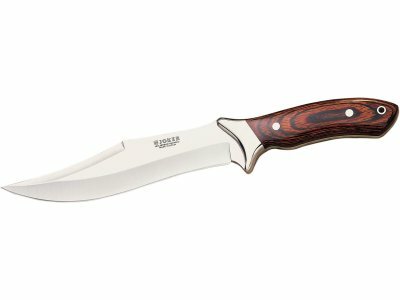 If you have a specific preference for the look and feel of the handle, then please contact us before placing your order so that we can mke sure we have the right knife for you.